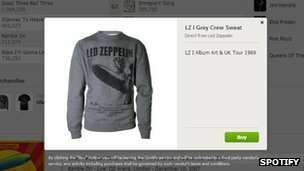 One of the most popular music streaming services in the world, is soon to be releasing a merchandise section. They are doing this to help build their relationships with artist's and record labels, to possibly allow for them to get more tracks from other artists, and to allow the artists to get more out of Spotify. They have said that they will not take any percentage of the money from the products sold through this service, again strengthening the artists relationship with them. Why Change? Well with Dr. Dre's incredible success in the headphone industry the news that he is making a Streaming service is disconcerting to Spotify and all other rival companies, as beats is already a very well established brand and that alone can take its service to the top of the market. This creates many worries for Spotify such as how they are keep artists on board with them instead of Beats, so as a countermeasure they have created the merchandise shop. Their idea of taking no profit should give most artists an incentive to stay on board with them and not move. With this new feature it will be very hard to beat Spotify, which recently announced it has over 20 million songs and adds on average 20,000 a day. This shows us that really all Spotify are doing is advertising the product and redirecting you to the purchase page of the artists shop, and also shows us none of the purchases are checked or managed by them, so don't complain to Spotify if something goes when buying a product!